Many folks who are fans of the Navy’s dynamic flying team, the U.S. Blue Angels, will plan vacations to the Gulf Coast to coincide with a show or practice. 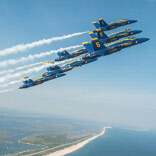 We are fortunate that Pensacola, our neighbor to the west, is home base for the Blue Angels. If you can’t make a show, there are several practice times throughout the year. The Blue Angels website also list the times when the pilots are available after practice for autographs at the National Naval Aviation Museum located at NAS Pensacola. If you need to plan your vacation in Destin, FL, check out potential lodging here.